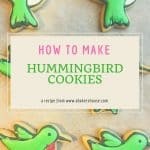 These adorable hummingbird cookies are a fun way to celebrate the annual delight of the return of hummingbirds. The joy of of watching, feeding, and being awed by hummingbirds is contagious. Once you see these tiny birds zipping around you will be hooked. Where we live in Colorado we are treated to hummingbird season from May through October. The hummingbirds in our part of the country tend to be black-chinned, rufous, broad-tailed, and the occasional calliope. On the east coast my parents see a lot of ruby-throated hummingbirds. 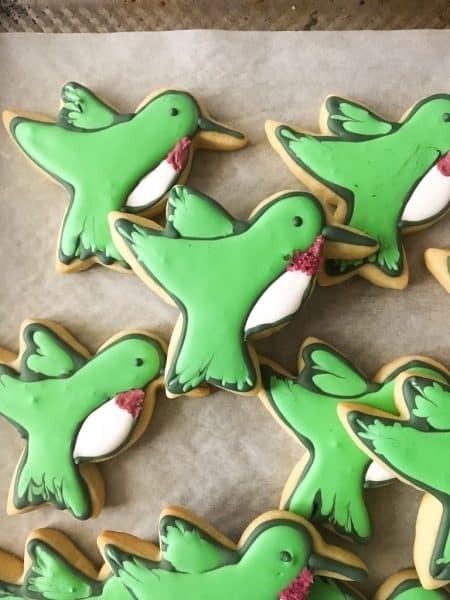 Looking through bird books gave me ideas regarding the colors for these hummingbird cookies. 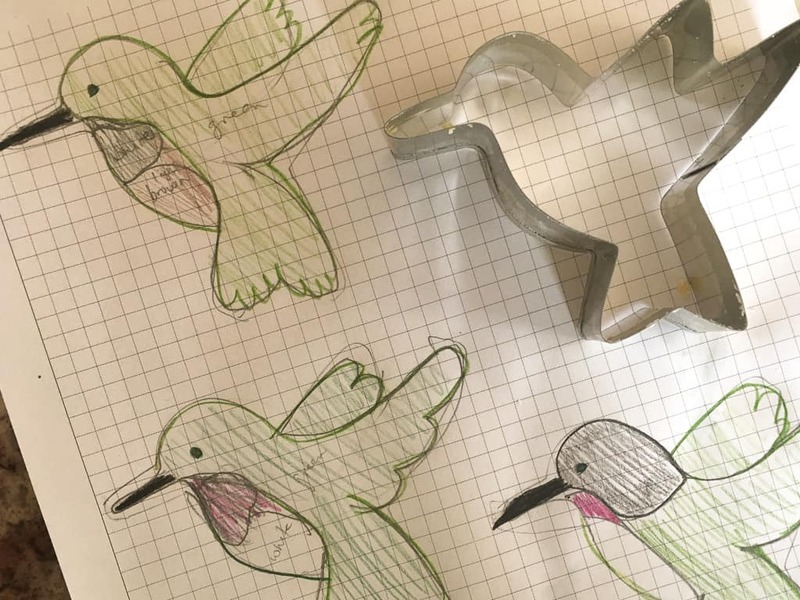 Sketching out the design on graph paper helped me with these hummingbird cookies. Do you use this method for decorating sugar cookies? Trace your cookie cutter on graph or regular paper. Use colored pencils or markers to fill in different sections until you reach a color palette and design you love. 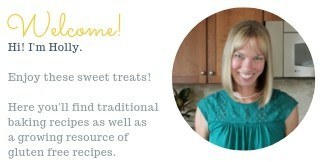 Put your favorite sugar cookie recipe to work; I often use Bridget Edward’s perfect cut out recipe on her blog Bake at 350. 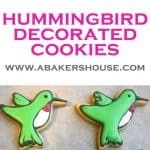 A hummingbird cookie cutter from Amazon is a good place to start with your cut out cookies. Play with royal icing colors– you can’t go wrong since hummingbirds come in many colors of the rainbow. I started with a dark green outline and before it dried I filled in the body with a lighter green. Use a toothpick to pull some of that darker green into the lighter green, creating the look of feathers. Next add the white with a burst of magenta color (with or without sprinkles) on the throat area of the bird. 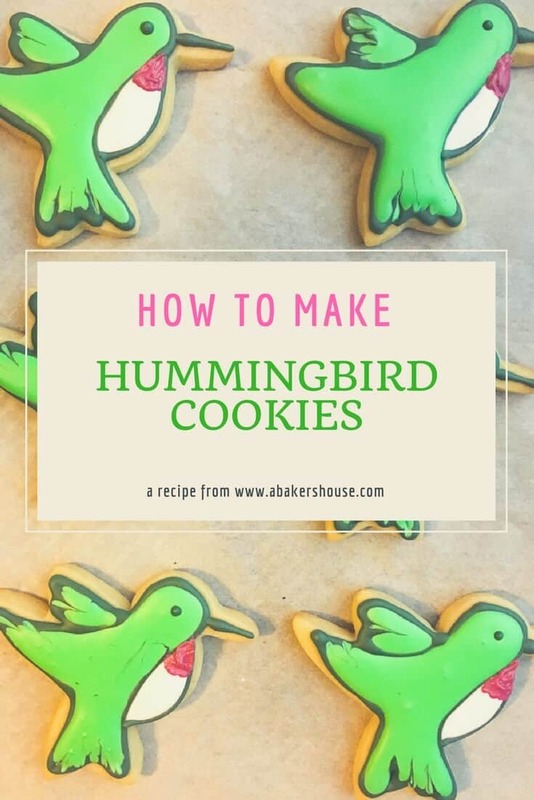 A beak and an eye finish off these playful hummingbird cookies. Are you on Pinterest? I am! Join me there by saving this pin! One year I sent these to my mom. Check out these tips for packaging cookies for the mail. Are you a bird lover like me? 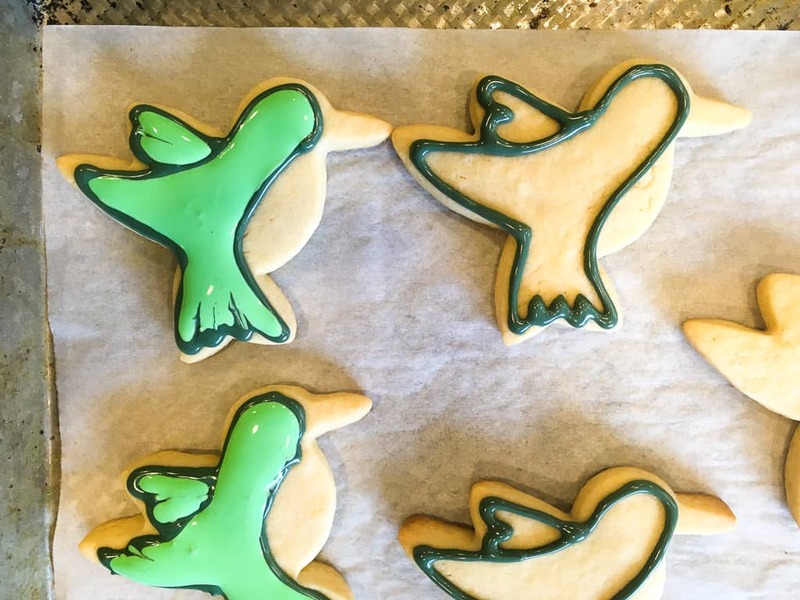 These Seagull Cookies may make you smile too. Once you spot your first hummingbird you will want to learn how to keep these little beauties coming back each year. You can plant hummingbird-friendly plants. Our local garden center labels which plants make nectar that attracts hummingbirds. You can set out feeders — this glass humminbird feeder is our favorite. Easy to clean and to refill and the birds love it!